This one is for all of my Harry Potter lovers out there, and I know there are quite a few of you. Yes ladies, I’m challenging YOU to be bold with your lip color. WOCs generally have full lips, so why not use them as a canvas for spellbinding beauty? 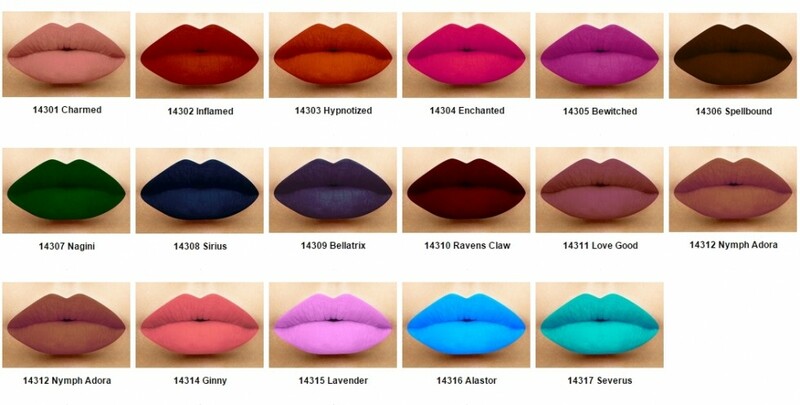 LA Splash has debuted 17 new matte liquid lipsticks in honor of the amazingly popular Harry Potter series. These colors are named after iconic spells from the books, and the colors are just as captivating. My faves are Spellbound (a deep, warm, chocolate brown), Nagani (a vibrant jewel tone green), Bellatrix (an iridescent purple), and Sirius (a deep sapphire blue). I chose these colors from the collection, because liquid lippies have been a huge trend lately, so I am already maxed out on the traditional shades. I’ve even ventured into the unconventional nudes. Now I want unique colors. I believe this collection is a great opportunity for us all to step outside of our comfort zones and do something a little bit daring. Often times we are timid about wearing bold color on full lips for fear of ridicule. I say, use those soup coolers as a billboard for boldness! I’m going to purchase the four colors I’m loving on from this collection, and I will post pictures on my Instagram account. Check me out over there, follow me, and show me some love. Let’s inspire each other to embrace our natural features and showcase them in amazing colors without no fear! Let’s take a cue from Harry Potter and face our fears head on with the power of magic, aka makeup (lol).